GERD Awareness Week is November 18-24, 2018. It’s observed during Thanksgiving Week because after a large feast, many individuals suffer digestive discomfort. Heartburn is the most common symptom of gastroesophageal reflux disease (GERD). Others may include regurgitation, a chronic cough, hoarseness and chest pain. Each person’s experience can be very different. The cause of GERD is stomach acid backing into the esophagus due to a weakening of the lower esophageal sphincter, which is a muscular ring of muscles that opens to allow food to pass into the stomach. Over time, untreated reflux disease can create an abnormal lining called Barrett’s esophagus, which can lead to cancer of the esophagus. This cancer is the fastest rising cancer in the United States, with over a 600 percent increase in the last three decades. Today, over 30 percent of the U.S. population suffers to some degree with GERD and most are treated with over-the-counter or prescription proton pump inhibitor medications. However, studies show that about 7 million people are failing treatment on proton pump inhibitor medications and are dissatisfied with their treatment. One of the issues for those who suffer from reflux disease is that there are very few medical centers nationwide that offer physicians who specialize in reflux care and comprehensive diagnostic testing and treatment. 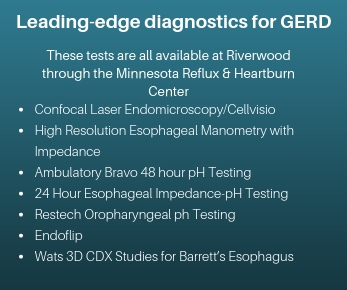 Established in 2015 at Riverwood Healthcare Center and Cuyuna Regional Medical Center, the Minnesota Reflux and Heartburn Center (MRHC) offers advanced solutions for those suffering from GERD. A staff of highly trained and experienced physicians specializing in reflux is assisted by nurses, dietitians and technicians for a team approach and smooth access to comprehensive treatment of GERD. Dr. Paul Severson heads MRHC as medical director, practicing with Dr. Howard McCollister, Dr. Tim LeMieur, Dr. Shawn Roberts and Dr. Andrew Loveitt. This outstanding team of reflux specialists is dedicated to the treatment of GERD and related disorders using highly specialized treatments and the latest diagnostic equipment. The MRHC reflux specialists are renowned for their expertise in advanced minimally invasive reflux surgery. Since 2013, they’ve been performing the LINX magnetic sphincter augmentation procedure, which is not widely available in our region. The LINX System is a small flexible bracelet of interlinked titanium beads with magnetic cores. It is implanted with a minimally invasive, outpatient procedure around the weak lower esophageal sphincter. The magnetic attraction between the beads helps the LES resist opening to gastric pressures, preventing reflux from the stomach from going into the esophagus. Swallowing food temporarily opens the magnetic bond, allowing food and liquid to pass normally into the stomach. MRHC also offers other minimally invasive procedures, such as Nissen, Toupet and Collis-Nissen fundoplications, to treat GERD. These are surgical procedures in which the upper part of the stomach is wrapped around the lower end of the esophagus and stitched in place, reinforcing the closing function of the lower esophageal sphincter. Contributing to outstanding patient satisfaction is a concierge-type service with a designated nurse coordinator to facilitate the entire process of GERD care. At Riverwood, the MRHC nurse coordinator is Dawn Harcey, RN. She follows each patient through the entire process of clinic appointments and testing. This entry was posted in News & Information, Uncategorized and tagged heartburn and reflux care, innovative treatment for heartburn, latest treatments for GERD, Minnesota Reflux and Heartburn Center, Solutions for heartburn and reflux. Bookmark the permalink.